Who Run the World? 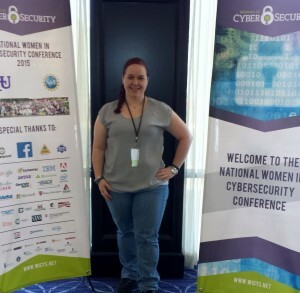 Women in Cyber Security (WiCyS)! “WiCyS was incredible — an event that all women in computing should be a part of! We had the privilege of hearing some amazing female leaders in the cybersecurity field speak, including Phyllis Schneck, a director for cybersecurity with the Department of Homeland Security, as well as Jenn Lesser Henley who runs the security team for Facebook. In addition, the conference offered numerous career-boosting opportunities including a resume workshop, a job fair, as well as information about graduate studies. A variety of workshops were also part of the program, including packet sniffing, a look into digital forensics, network packet analysis, and my personal favorite, a capture the flag competition hosted by Facebook. The capture the flag workshop was the very first Facebook workshop run exclusively by women and presented to an all women audience — we made Facebook history that day! WiCyS is only in its second year, though its attendance has nearly tripled since last year. As an information technology (IT) major, it is not hard to recognize that I am a minority in the field. I am often the only girl in my classes, and having attended a few Computer Society meetings, I can tell you that there are only a couple of girls at those meetings as well. While I enjoy the challenge of being a minority and standing out, when I heard about a conference that gathered women in my field, I knew it was something I had to be a part of. 1. Don’t limit yourself. Apply to anything and everything that interests you and don’t be afraid of rejection. For every 20 ‘No’s’ you get, there will be that one ‘Yes’ eventually. 2. Find an area you love and run with it. The saying goes that if you love what you do, you will not work a day in your life. I personally love computer forensics and I couldn’t be more excited to start working once I graduate. 3. Try to learn something new every day. The good thing about IT and cybersecurity is that it is evolving and changing at a rapid pace. Something new is always rolling out, so it is super easy to always be learning and growing. 4. And finally, go out of your way to help other women. The best thing we can do as women in a field where we are outnumbered is to motivate, encourage and empower each other. Seidenberg is proud of its commitment to supporting women by offering a variety of clubs and events for women to participate in. Among these include some of our other pride-and-joys such as BlackGirlsCode, Lean-In Circle, and WriteSpeakCode. Also worth mentioning is Pleasantville’s initiative to launch a “Women in Technology” mentorship program this coming Fall!